Our second attempt to travel to Jordan was a success after dodging flash flooding in the desert the previous day. Thankfully our local tour company was flexible and able to take us. An early start to the morning put us at the airport at 4:45 AM local time. We anticipated a long wait and process through Israel security. This time it went a little more smoothly, albeit lengthy. We left from Sde Dov airport promptly for our flight to Eilat, the southernmost city of Israel on the border of Jordan located at the northern point of the Red Sea. The border crossing took about an hour. We then loaded another tour bus waiting on the other side, and made our way on the two-and-a-half-hour ride to Petra, stopping once to pick up others in Aqaba and another time for refreshments along the way. The drive to Petra was beautiful. 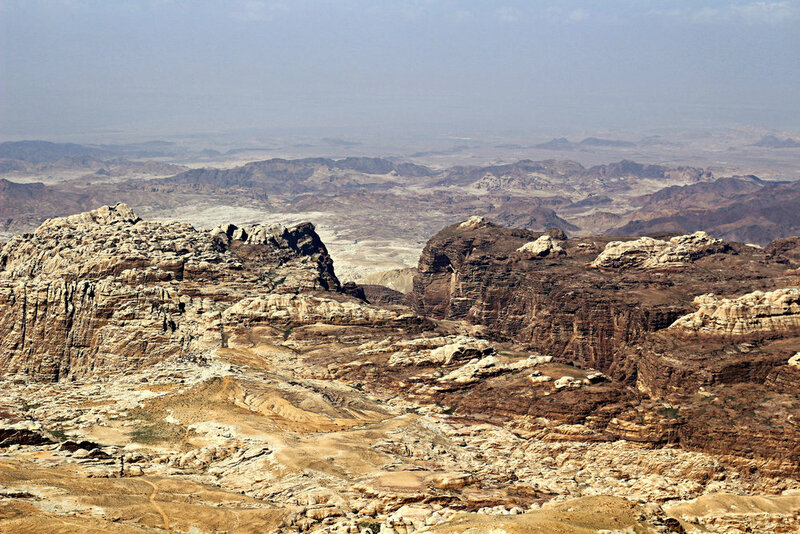 We passed nearby Wadi Rum, a protected wilderness area filled with beautiful red-orange rock formations and sand—an otherworldliness desert landscape. It is the landscape you might think of when someone mentions the Middle East. It is beautiful. Our tour guide mentioned several movies that the area has been used for filming to represent Mars, including the 2015 movie The Martian. Petra is one of the Seven Wonders of the World and the famous archaeological site with rose-colored carved sandstone structures. Upon arrival, our tour guide gave a brief orientation to the once capital of the Nabatean Kingdom, an Arab community that inhibited the area around 600 BC to around 100 AD at which point the Romans took over. The city is accessed via a long narrow canyon with soaring walls called Al Siq. The canyon is a long 30-minute walk to the first structure and the city’s most iconic, the Treasury (as seen in Indian Jones and the Last Crusade). Horses are also available for hire from the visitor center, if preferred. From there, we walked to the area of the Royal Tombs and the site of the amphitheater that features 8,000 seats carved from solid rock. Inside the site, there are several artisans selling goods and Bedouins, nomadic Arabs, who set up small stands to sell local handicrafts. They also offer camel rides and are happy to let you photograph their camels. We were asked by our guide not to purchase items from children to encourage them to stay in school. (A little fact: Jordan leads the region in education investments. It's literacy rate, at 91%, is among the highest in the Middle East.) We were also told to avoid ancient coins as those are a scam (for future travelers). My time was spent exploring and photographing the sites. Our tour left just enough time to make it to the amphitheater before we had to turn back and catch our flight to Tel Aviv. The site is more than 100 square miles. One could easily spend three to five days hiking the paths and seeing the entire ruins. The experience was awe-inspiring. It was the highlight of my trip. And although I would like to experience more of Petra and Jordan, I thought our tour was perfect for the time we had available during our travels. After dinner, we jumped on the tour bus and headed back to the border to catch our flight in Eilat to Tel Aviv, where we met with my husband and rested for our trip to Jerusalem the next day. The following video contains photos and footage from the tour. (Also see photos in the gallery below.) The video footage was filmed on an iPhone vertically to show the scale of the canyon. This is the first video I’ve ever produced using the YouTube editor. I realize that vertical filming isn’t optimal for viewing and have made that note for future filming. Please excuse the camera shaking. The paths are rocky. This post is a series about travel to Israel and Jordan, from February 24, 2017 to March 5, 2017. They are posted in order of the trip itinerary. Continue reading this series by jumping to the previous posts about exploring Haifa and things to do in Tel Aviv and on Shabbat in Israel.